I'll come clean up front and humbly confess that I know next to nothing about 10cc. Other than their unusual moniker and a few of their popular singles they remained outside my scope of awareness. (I'll readily admit the haunting, uniquely-constructed aura of their 'I'm Not in Love' is darn near irresistible and it's a genuine landmark of studio technology.) Just in case I'd been missing out on some incredible music all these years due to my ignorance of their art I picked this record at random to hear what they're all about. In my brief investigation of the group's history I've learned that, after putting out four reasonably successful albums, a sizeable rift that had been developing for some time finally ruptured in 1976 and rent the band asunder. The guys left behind, Eric Stewart and Graham Gouldman, decided to carry on the legacy. They enlisted the help of their tour-support drummer, Paul Burgess, and set out to prove that they really didn't need the other two dudes, anyway. 'Deceptive Bends' is the result. While I'm not familiar with the work of the two that made a run for it (Kevin Godley and Lol Creme), my understanding is that they've earned quite a reputation for themselves in the progressive rock universe since the split and I hope someday to sample their handiwork. Having sat through multiple plays of this particular LP, though, I feel somewhat comfortable in saying that when Kevin and Lol left the fold they must've taken most of the institution's prog inclinations with them. 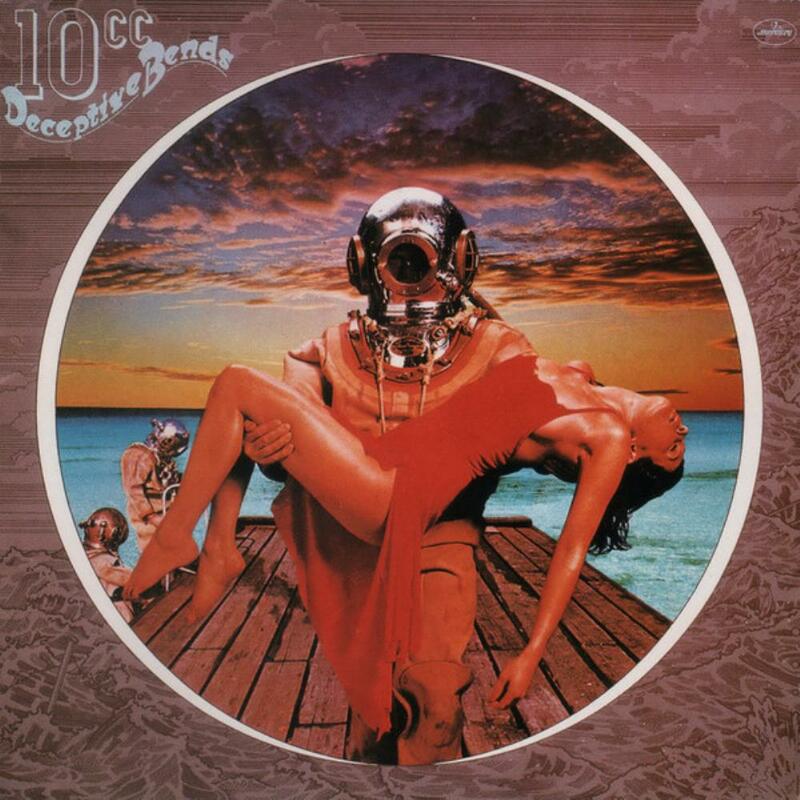 I can comprehend to an extent why 10cc qualifies as being prog related but in my estimation, based on this batch of tunes at least, their connection to the genre is tissue-ply thin. They begin with the upbeat 'Good Morning Judge.' It's semi-funky in an Alan Parsons Project way and what I mean by that is it's far too squeaky clean and pasteurized to be deemed anything close to authentic R&B fare. I'm a fan of crisp production, however, so I don't find the song to be bereft of all appreciable merit. The guitar work is performed expertly, for example. Keep in mind I do have a soft spot in my head for high-quality pop rock (which this tune is) so its minor shortcomings don't offend me too much. 'The Things We Do for Love' is next and, to be honest, I can't treat it fairly because I'm sick and tired of hearing it on the classic rock radio airwaves. It's a meticulously- designed but overly-formulaic ditty that has never done much for me because it's just too dad gum fluffy. I'm sure they were tickled that it became such a monster worldwide hit for them (it rose to #5 in the US) but to me it's an unremarkable bore. 'Marriage Bureau Rendezvous' follows and with it things improve considerably. I especially admire any ensemble that manages to toss in some melancholy humor to keep things leaning toward the bright side of life. I found this number interesting due to their taking a few detours along the way (Not unlike what Paul McCartney would often do with Wings just for grins). Unfortunately, they take a dive to the bottom on the next cut, 'People in Love.' The syrupy orchestral score only makes this buttery ballad even less substantial and interminably more wearying. This song is DOA. Nothing to see here, folks. Move along now. I suspect that Eric and Graham had been digging on Steely Dan's 'Pretzel Logic' because the Fagin/Becker influence runs throughout 'Modern Man Blues,' most noticeably in the verse structure. The chorus does deliver an abrupt change of direction, though, and all in all it's an odd little composition that's at least unpredictable. 'Honeymoon with B Troop' is one of the more enjoyable tunes on this record. I must acknowledge that they had an eclectic attitude that kept them from being corralled with the run-of-the-mill commercial acts of that era and I find their bold employment of studio tricks entertaining. In some aspects they're a slicker-sounding Electric Light Orchestra, yet not as adventurous as Jeff Lynne and his pals were. 'I Bought a Flat Guitar Tutor' is an unexpected, drastic departure from the norm. Here they plunge straight into the brand of nostalgia that Queen was fond of taking on without warning. I'll say it's short and sweet and leave it at that. 'You've Got a Cold' is a bouncy little number about, obviously, being under the weather and contagious, but it fails to charm because of the dearth of imagination involved. A big dose of satire would've helped tremendously but, as a novelty song, it falls flat. The closer, 'Feel the Benefit (Parts 1, 2 & 3),' is an eleven and a half minute musical excursion where an engaging mix of light guitar and tactful symphonic strings open the proceedings. Then the vocals enter to create some intriguing aural scenery that allows the listener to follow along effortlessly. It's without a doubt the proggiest track on the record. They eventually return to the original theme and motif but the second time around it's much more forceful and dynamic. Alas, it loses some of its momentum as it winds down to the 'swaying Bic lighters in the arena' finale but that miscalculation doesn't completely spoil the piece altogether. Released in June of '77, this LP didn't disappoint their label one iota. I recall seeing its distinctive cover standing out from the madding crowd in the record bins and I assume its sales figures were boosted greatly by the Top Ten single it spawned. But when it comes to British Art Rock my preference would be the more consistent Supertramp, the aforementioned ELO or even the delightfully wacky Gentle Giant. This album ultimately left me unsatisfied and hungry for something with a bit more meat on the bone to chew on. 'Deceptive Bends' is clever in places but too often I feel that Stewart and Gouldman were trying too hard to be cute, adorable and marketable rather than daring to be exploratory and radical in their approach. I don't mean to be too hard on the boys but I have to call 'em as I see 'em and this disc ends up on the weak side of average. 2.4 stars.